At the welcome for Rev. Terry Williams, the new Vicar of St. James Codnor I was invited to give him the welcome from the Free Church movement and specifically from Waingroves and Codnor Methodist as Covenant partners. In order to do so I thought it would be good to present him with a welcome gift and so after long and extensive research into his likes and dislikes I presented him, on the night, with a Macdonalds free coffee voucher. A bit of fun to try and make him feel as though he is amongst friends. Sometimes in Church life we squeeze out the fun element and we become too serious. We worry over this committee or that committee; we agitate over deadlines; over hymnbooks and certainly concern ourselves too much about the length of the service. Jesus said, “I have come in order that you might have life – life in all its fullness”. ( John 10:10) However we almost inhibit that life by filling it with society’s expectations of Church. The world in its media etc. portrays the church to be full of elderly, dour, unexciting people and its clergy is always out of touch wimps who owe more to Derek Nimmo than Dawn French. Yes it’s a sweeping generalisation but the world deals in generalisations. My experience of Church people is that they are usually ready for a smile, a laugh, and a time of enjoyment. Yes, we all have our down moments, but don’t let’s forget the “up” moments. When Jesus said about giving us life, I believe that he referred to eternal life but we need to remember that eternal life begins for those who believe in him, now. A famous poem begins “If I had my time to live once more I would…………………….”and goes onto explain the good things the writer would engage in. She speaks of worrying less and laughing more, of eating more baked beans and ice cream and of general enjoyment. I would want to rewrite the poem in the light of the Church “If I (the Church) had my time to live once more, I would have fewer meetings about nothing, and more meetings about life; I would have fewer communions with bread and wine and far more with loaves, cake and a feast; I would have more time to laugh and take time off from grumbling; I would enjoy colour and brightness and forget the darkness of the world more…………………” and so it goes on. Why don’t we spend some time as we approach Easter thinking about what is important for us, what we need to hold onto more and what we need to let go of, what can and ought to be changed and what needs to be cherished. Lets all learn to laugh more and enjoy the life that God created, the life that Jesus redeemed on the cross, and the laugh that is lived with the Holy Spirit. Just got back from my evening stint at Radio Salistune jointly presenting a short radio programme with Richard Whitehouse (local Pastor from Selston Church of Christ). Great fun playing Christian music centering on Easter, and chatting about Easters we have known, trying to draw out the importance of Easter and the power of the cross. Radio Salistune is a local radio station covering Selston and the Ashfield area. ( http://radiosalistune.wetpaint.com/) It features twice a year for a week at a time, using a team of about 40 volunteers. Its very professional and this year for the first time can be listened to on the net. Why not tune in and have a listen. In particular you might want to catch Richards follow up show on Wednesday at 12.00 noon until 1.30 p.m.
Interestingly I also received an invitation from Premier radio (London based Christian radio station) to be interviewed by them about Christian leadership in mission and evangelism areas. I read the letter as a standard one sent out but Alison is of the opinion that it has been sent to me and probably certain other Christian leaders in the area, to see who would be available. It certainly seems to be a standard letter with a more personal touch, if that makes sense. I’m not holding my breath but it is nice to be thought of (if I have !). Maybe that training Rob frost gave me in 2000 or the training we did in Ministerial college won’t be wasted after all. 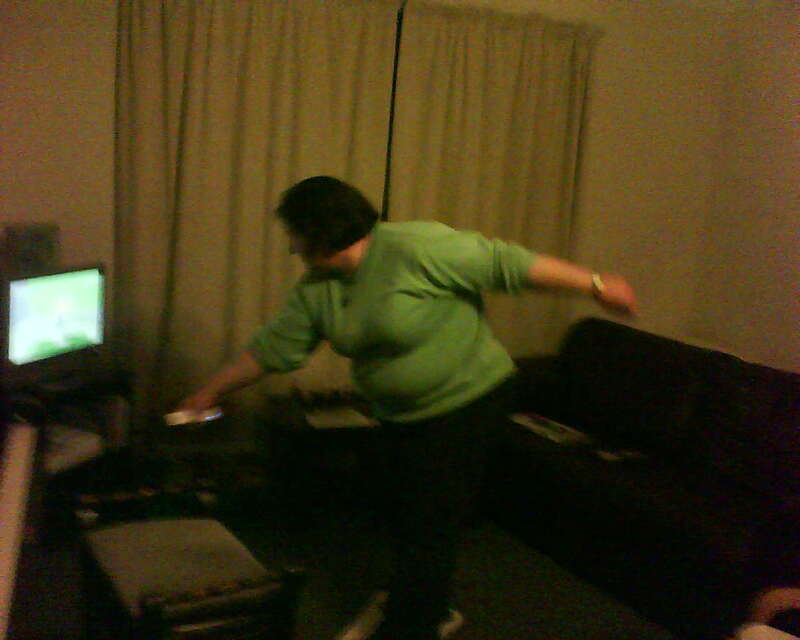 Now Alison is up and running on the Wii fit. Seriously, we’re all enjoying this and hopefully losing some weight as well. Can’t get near it for the kids !! Its almost been a month since I last wrote anything. Sorry about that. Thought I’d better say something to prove that I’m still alive, if nothing else. As usual its been a busy month but now all my Church Councils are out of the way and its headlong into Easter. I’m beginning to prepare the Circuit Passover Service in which we’ll eat something of a Passover meal; beginning to look good. The Mission Shaped Intro course has gone extremely well. We’re in week three and everyone seems to appreciate it and many are speaking of being challenged by it. Good progress is also being made on the Mission Shaped Ministry course which we’ll begin in September right across Nottinghamshire and Derbyshire; a fantastic course which I attended in Lincoln last year (see earlier blog entries). We’re looking for forty to attend this one. For those of you wondering how the weight loss is going I seem to have lost between 3~4 pounds. Doesn’t seem much but its a start. 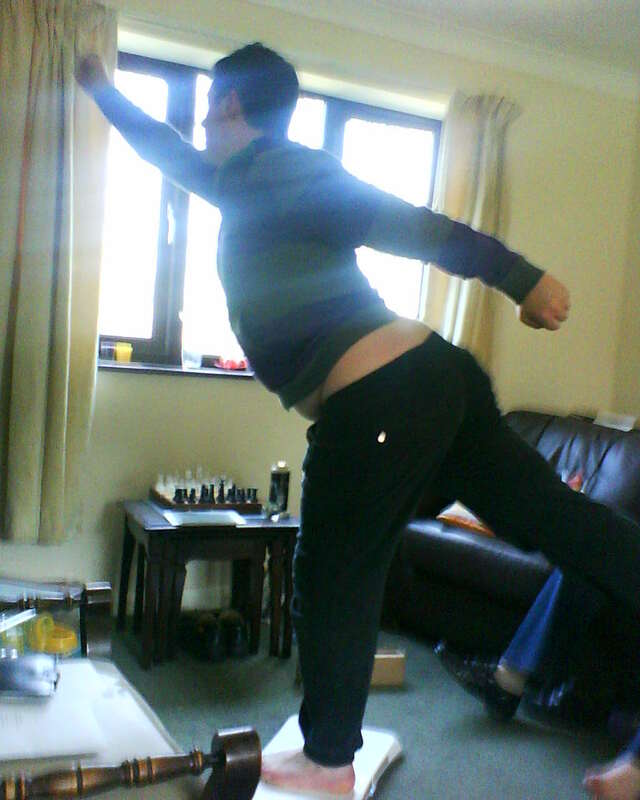 Bought a Wii fit today and it estimates my age as 49 (!) I love this machine seeing as my age is 50. Jamie who lives with us is 37 (real age 20) and Rebecca is 35 (real age 24) so I feel VERRRRRRRRRRY good. Alison is away in the Lake District this weekend so we’ll see what age she is when she returns.